George Edward Dark was born on 23 June 1889 to George Dark and Elizabeth Ann née Philp in Croydon, Surrey. 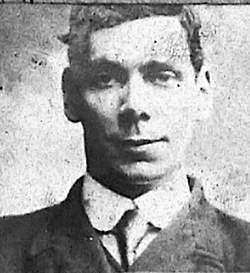 His youngest brother, Stephen John, also served during the war. George's childhood was spent moving from place to place including homes in Bristol (1891) and Abergavenny (1901), while the births of his younger siblings were variously registered in Cardiff and Newport. The family came to live in the parish of Frampton in 1904 and had settled in Fromebridge by 1911, George Edward working as a farm labourer. George joined the Mercantile Marine but, as the records are incomplete, his full contribution is not known, and his identity certificate only covers the latter period of his service, 1919-21. This lists (by identification number) the ships he served in during that time. As a donkeyman he was responsible for operating and maintaining the 'donkey' or secondary steam engines for powering machinery such as derricks and winches. George was awarded the British War Medal and Mercantile Marine War Medal, so he must have seen considerable wartime service. His son Bryan remembers his father telling of being torpedoed three times, encountering pirates, and running aground off Nova Scotia! On 9 April 1924 George married Elizabeth (Bessie) Annie, the sister of Thomas Edward Hunt, also of Fromebridge. George was still a seaman and, in fact, stayed in what had become the Merchant Navy until at least 1933. They had four children: Norman, Bryan, Beryl and Shirley. Later George was employed at the RAF No. 7 Maintenance Unit at Quedgeley, while Bessie was the local post lady. George Edward Dark died at his home, 2 Whitminster Lane, on 4 March 1968 and is commemorated at Gloucester Crematorium. He is also among those listed on the plaque in the village hall in respect of his war service.